There has never been a more important time to share the message of peace. Share the Gift of Peace by and inspire a new generation of peace makers. Road to Peace is inspiring audiences all over the world! the embrace of this great spirit that is the Dalai Lama"
We will assist with promotion for your group’s screening event on the Road to Peace website and on our social media channels. Leon Stuparich, Director and Producer of Road to Peace, may be available to attend your Q&A on request, sharing his experience of making the film and answering any audience questions first-hand. 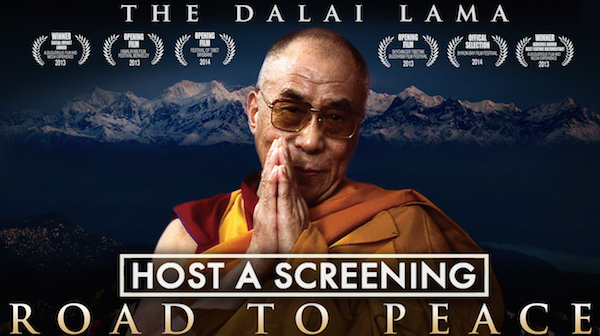 Hosting a screening of Road to Peace will give your audience a direct experience of peace, whilst sharing a rare behind the scenes view into everyday life with the Dalai Lama. “Road to Peace is a remarkable film. This in part has to be true because it is about the Dalai Lama. But essentially its special quality is because through the lens of Leon’s camera, the unique personality of the man telling us he doesn’t do miracles, does indeed perform a miracle as he moves people along the Road to compassion and World Peace. When the film ended, we in the audience went on asking questions, making comments, and relating allied experiences. There was an opening up to each other from different faith positions, in a community concern to be active in peace-making. “Sometimes gifts come from unexpected places! When organizing the screening of “ROAD TO PEACE” at The Bamboo Buddha Cafe, Sydney, I had just two things in mind; to celebrate His Holiness’s 77th Birthday and to honour a pledge to raise funds for The Tengyur Translation Project. What I actually gained was far more enriching than I could have imagined. The expression of appreciation from the audience afterwards, was both overwhelming & completely disarming. There was such a beautiful energy in the room of warm heartedness and harmony catalysed by His Holiness and the ingenuity of the film makers art. This is the gift of “Road To Peace”, that it actually engenders the feeling of peace within those who behold it. 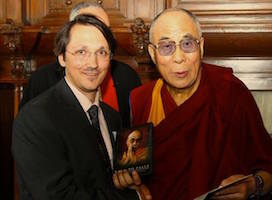 “The film Road to Peace which follows the UK visit of the Dalai Lama is full of insights into a man with exceptional wisdom. It was fascinating to watch him travelling between British cities and drawing large crowds in order to impart his highly spiritual and pragmatic principles in a meaningful and humorous way. Sometimes just by using a few carefully chosen words the Dalai Lama is able to express his simple but profound message for humanity at this time in human spiritual evolution. We are committed to promoting peace and human values with our films. Any further profits are reinvested into future productions to create positive social change. Meditation helps find inner peace. Bob Dylan wins the 2016 Nobel Prize for Literature! Ginny zalnoski on Richard Gere tells us to live a full life, there’s a powerful reason why. Sharon Boyd on Richard Gere tells us to live a full life, there’s a powerful reason why. Hjördís Diljá Bech on Richard Gere tells us to live a full life, there’s a powerful reason why. Nikki on Richard Gere tells us to live a full life, there’s a powerful reason why.